Dispatchers from Columbia County 911 recently completed Cardio-Pulmonary Resuscitation (CPR) recertification training. The training, administered by New York State Police Trooper/Canine Handler Brennan Keeler, included four hours of instruction designed to provide healthcare professionals the ability to recognize several life-threatening emergencies, provide CPR, use an AED, and relieve choking in a safe, timely and effective manner. All Columbia County 911 dispatchers are certified in CPR/AED and are required to complete 21 hours of continuing education annually. The dispatchers completed refresher training in emergency medical dispatching earlier this month, and will travel to Pittsfield, MA for additional training in domestic violence and suicidal callers in the coming weeks. Trooper Keeler is an American Heart Association certified instructor and was himself once a Columbia County 911 dispatcher. Members of the Columbia County 911 Dispatchers Benevolent Association present Columbia County Fire Coordinator John Howe with a $250 donation to the Columbia County Burned Out Victims Clothing Fund. The donation was made as part of the dispatchers' annual holiday donations. Pictured, left-to-right, are 911 Dispatchers Steve Meehan (11-82) and Robyn Sweet (11-81), Fire Coordinator John Howe, CC911DBA Vice-President Dana Petty (11-79), and CC911DBA President Frank Martin, Jr. (11-76). Photo by 911 Dispatcher Richard Lindmark, (11-27). LAKE GEORGE, NY -- A group of five dispatchers from the Columbia County 911 department recently traveled to Warren County, NY to attend specialized disaster deployment training. The Telecommunicator Emergency Response Taskforce (TERT) training provides dispatchers with the skills and expertise needed to safely and efficiently deploy into disaster zones to assist local jurisdictions with emergency communications. Attending the training from the Columbia County 911 department were dispatchers Lori Bartlett, Holly Gambacorta, Donna Gleason, Kevin Johnson, and Robyn Sweet. The Columbia 911 dispatchers join a group of just 150 other dispatchers across the state to make up the New York TERT team. 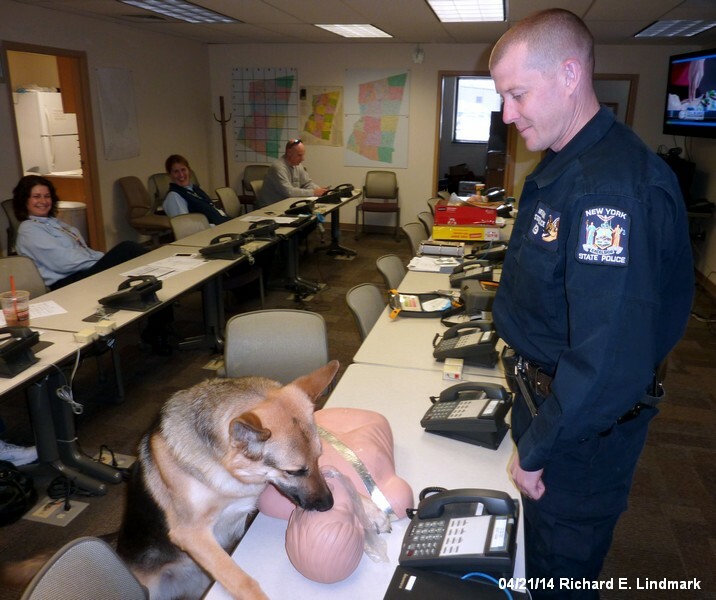 HUDSON, NY -- The year 2011 was the busiest ever for the Columbia County 911 Department. Nearly 59,000 calls for service were answered resulting in over 40,000 dispatches. STAATSBURG, NY -- Dispatchers from Columbia County 911 recently completed Advanced Law Enforcement Dispatcher training at the New York State Park Police Headquarters in Staatsburg, NY.